The patented designed set contains a latex neckseal firmly sealed between neckrings. Neckseal has large opening; ribbing lines for cutting; raised ports to stop drainage into tubing; (2) port caps and an accessory port. Large Hood contains two additional 22mm ports and measures 12 3/8″ (314mm) x 11 1/2″ (291mm). 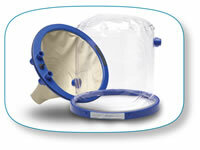 Neckseal is single-patient, multi-use and Hood is multi-patient use.